I had the same problem, I changed the xpi version number and it works like a treat. Is there a workaround for FF to adddress this memory issue.? Are there people that agree. with me just from testing and benchmarking the two browsers? 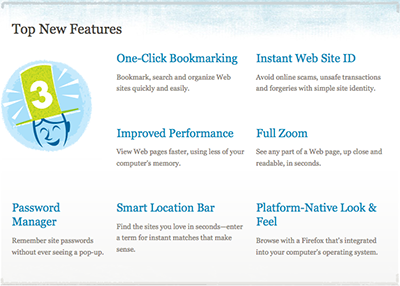 I really like the browserand its new features in spite of the memory issues that it has. That whole spreadfirefox record thing has to be the biggest joke. Someone wanna find me a nice safari skin? It still looks awful in OSX. I totally agree with you on the record thing. Lack of preparedness is going to make it their own fault. You want the "Yummy" one. I want the mac theme on windows dammit! Like, now! And tanjihay to make Foxdie work with 3. His skin was awesome. Hmm, maybe I'm too purist, but I kinda like Safari more. I haven't installed Safari 4 yet (I downloaded it, but I want to make sure my latest project will work on the previous version), but I love the latest 3 version. 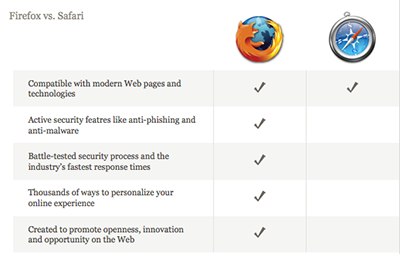 FireFox 3 is fine, I have no real problems with it, I am just accustomed to the beauty of Safari. Is anybody else getting this problem? I'm running Vista 32bit. It's not bad, however the new GUI is terrible. I need a Safari skin for windows asap. I'm running Vista Ultimate (32 bit) and FF3 works fine. Using it right now to type this. Oh frak.... I so want that for Windows. Too bad it's only for OS X. Cause I use only safari on OSX... and FF on Windows. Just my luck, eh? I have to 100% agree with you there. I was only able to download FF3 at 11am London Time, cus I wasn't going to wait all night for it. Mozilla know how popular their browser is, so why did they bother to try and break a world record and not even use decent servers . . . I hope they set the record but tbh because of the server problems they had they aren't going to have such a big record as they could have had. Overall though I thinks its fast . . . i mean REALLY fast. I don't actually mind the skin for it either actually although I do like those other themes someone posted earlier. I was able to use those themes on Vista, what problems are you having? But serisouly, last time I tried using GrApple theme (the OSX only, pinstripes one) on Windows it screwed my browser... I mean it was total FUBAR. So I don't know if I really wanna go daredevil on the whole thing again. 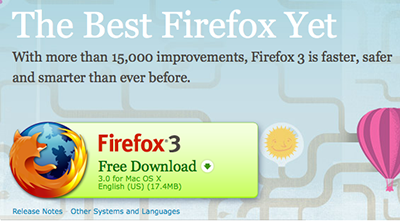 so tell me people, how is the new FireFoX 3, it is worthy to upgrade from v.2 to v.3? - and what about the skin'ing it, any coOl mac look alike skin's for FF3? I am not sure about - trying it, last time I tried, it totally messed my favorites thingy up...terrible days..
Now now... don't you entice me to something stupid..
Then again, I am not installing FF3 as of now. I downloaded it cause I had participated in pledge. But as a web developer I still have to clear some of my doubts about rendering styles. I know I can trust FF anytime over IE. Just making sure. I think I'll try it on my girlfriend's laptop... that thing is due for formatting, so if anything goes wrong. No big deal. They weren't counting on Steven Colbert to mention the launch on his show. Mac osx theme for firefox 3.0 on windows. Looks horrible. Bad text, menus are totally transparent, and many other problems. It's like you hacked the OS X version to work on Windows rather than attempted to do a proper port.